Social media is here to stay and continues to grow in the government space. We at Dreamgrow have long predicted that social media will penetrate corporate and government firewalls and will be integral part of our every day communication. 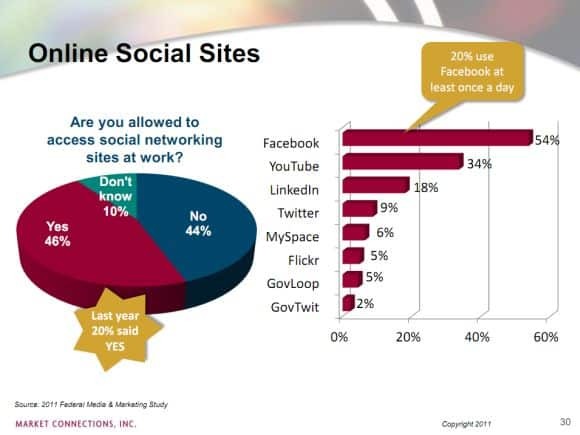 A new survey shows that 46% of government news consumers are allowed to access social media sites at work, that’s way up from last year’s 20%. “We’re all dealing with limited marketing budgets, and we don’t have a lot of margin for error. We have to be sure we’re reaching the right federal decision-makers with targeted resources.” — Lisa Dezzutti, president and CEO of Market Connections. 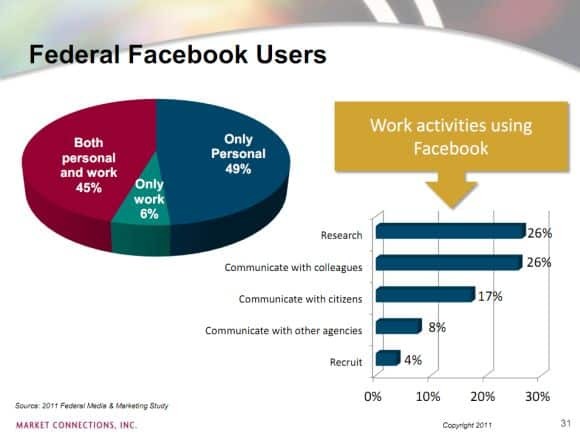 The study aggregates use of print, television, radio, mobile, and internet news and analysis products by senior federal employees. More than 2600 respondents at dozens of federal civilian and defense agencies. Hi Perry! For some reason your comment ended up in spam, but now its visible again. I think that more social media in gov means that you have the means to build your brand. People don’t spend a lot of time on web sites but they do at SM sites. So there you have an opportunity to be seen by your target group. You can get through red tape buy just talking to prospects as people, no hard sell. When the time comes you have this interaction on your side, some call it brand. Their access may be increased to social media; but I don’t know if that will translate into the reverse; i.e., my being able to reach their ears enough to make a difference in my competitiveness.